When winter begins, you have two options: you can pull the covers up over your head or you can suit up and head out for a winter adventure! 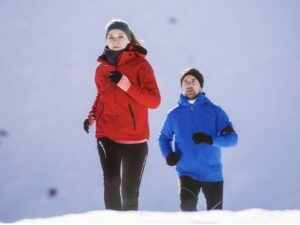 There’s no reason you need to take a break from physical activity when the temperature drops. Working out in the winter has some distinct benefits. In fact, winter’s chill can make you feel awake and invigorated. Heading outside in the winter is also a great way to take in the sunlight (in small doses). Not only does light dramatically improve many people’s moods but it also helps you get some vitamin D.
It is recommended for substantial health benefits that adults do at least 150 minutes (30 minutes 5 days a week) a week of moderate-intensity or 75 minutes (25 minutes 3 days a week) a week of vigorous-intensity aerobic activity. There is an easy way to tell the difference between moderate and vigorous activity. When performing moderate-intensity activities you can carry on a conversation, but you’ll be breathing heavier. During vigorous activities, you can carry on a conversation but will find yourself pausing to take a breath. Adults should also do muscle-strengthening activities that involve all major muscle groups on 2 or more days a week. There are many benefits to walking which is why it is considered a great form of physical activity, especially for those who are just starting to incorporate physical activity into their lives. It’s efficient. Just 30 minutes of walking a day can improve your circulation, lower your cholesterol and blood pressure, and help you lose weight. It’s free. The only thing you need to start is a pair of supportive walking shoes. It’s simple. There’s no equipment required, nothing complicated to learn, and you can do it right where you are. Just step outside. Staying warm and dry when heading out to exercise in the cold weather is all about layers. The best advice for dressing for outdoor activities in the winter is to layer your clothing. Layers help trap the heat and form a kind of insulation against the elements. Resist your instinct to layer with cotton. Once cotton becomes wet with sweat, the moisture is trapped and will actually make you feel colder. For your first layer, you want something that wicks moisture away (like the newer high-performance fabrics). Next, add a layer of fleece; finally, top with a thin waterproof layer. Use these tips to help make your holiday a healthy one! Combat the 3 to 5 pounds most people gain during the holiday season by being active no matter where you are or what the weather. For more information on physical activity contact Olivia Jones via email, olivia_jones@ncsu.edu or phone 252-232-2261.